Nothing about the story is the least bit uplifting. The manga series Attack on Titan, written and illustrated by Hajime Isayama, is one long unfolding tragedy. Nothing about the story, which concerns the pyrrhic efforts of humans trapped behind high security walls to reclaim their lost lands from the gigantic, carnivorous “titans” now roaming the countryside, is the least bit uplifting. Nor are any of the characters likeable, however heroic or skilled they occasionally prove to be. The result is a work of staggering genius that has somehow attracted an enormous audience in Japan as well as a large cult following in the United States, proving that you can’t underestimate the appeal of gruesome, Maurice Sendak-style illustrations of people being gobbled up by shiny-toothed behemoths (a subset of fetishists known as voraphiliacs--“vores,” in everyday parlance--even find such images arousing). I was raised by conservative, pessimistic parents who had a dim view of human nature. They believed that people were unable to work in concert with one another, and that all such efforts at cooperation would be undermined by self-interested cheaters and defectors looking to line their own pockets. Ronald Reagan, last of the Cold War presidents and a voluminous reader of pulpy science fiction during his youth, was described in historian Sean Wilentz’s Age of Reagan as thinking along similar lines, often asking assistants to consider how wonderful life would be if space aliens threatened the planet and forced nations to settle their outstanding grievances long enough to repel the invaders. This is the central premise of Attack on Titan: humans have lived behind three enormous walls for a hundred years, reluctantly working together as citizens of a single city-state, as they attempt to stave off the depredations of the marauding titans. 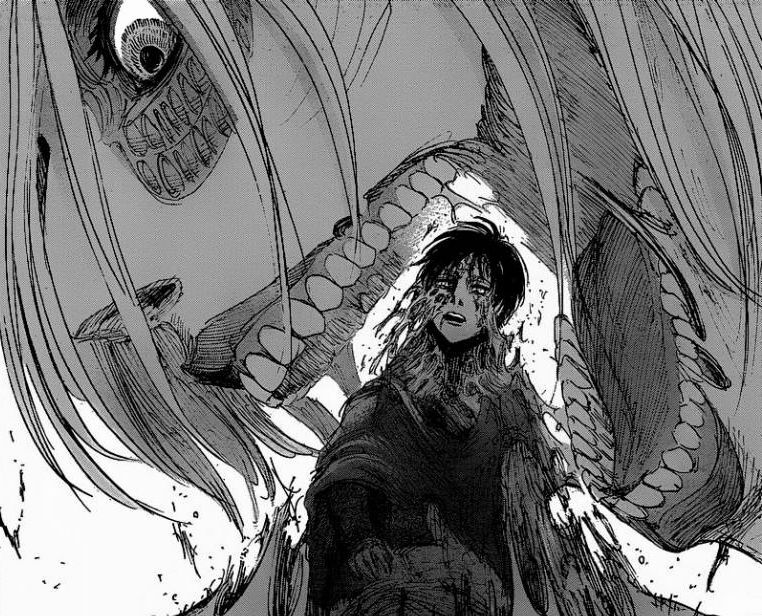 Although most of the brutes appear unintelligent, two especially powerful titans demonstrated surprising strategic abilities and launched a successful assault on the outer wall, killing protagonist Eren Yeager’s mother and thousands of others, and forcing the survivors to relocate inside the second wall. Population pressures and looming starvation led the royal government to order an expedition outside the walls, sacrificing a third of the human population and learning a bit about the physiology of the titans in the process. The mystery deepened when Eren Yeager, a one-note leading man whose sole desire is to kill the titans, his adopted sister Mikasa Ackerman, a prodigious hand-to-hand combatant whom Yeager had rescued from a sexual assault years earlier, and their precocious best friend Armin Arlert complete basic military training and enter the Survey Corps, a branch of the army focused on titan-slaying and exploration outside the walls. The resulting epic is not about mankind’s triumph in the face of horrific evil, but focused on the banality of betrayal and double-dealing. The leaders of the population dwelling in the innermost wall, well off by the meager standards of this world, simply want to preserve the status quo, as do the elite soldiers garrisoned there to protect them (the most promising trainees, with the greatest potential to defeat the titans, never see combat, much as how the best professors and teachers rarely set foot inside the classroom). Eren’s fellow trainees come under the direct supervision of Survey Corps commander Erwin Smith, a monomaniacal strategist willing to sacrifice as many lives as necessary to learn the secret of the titans, and his chief assistants. Captain Levi, an emotionless soldier raised by a serial killer, and Zoë Hange, a scientifically minded squad leader who derives intense intellectual enjoyment from torturing captured titan specimens. Erwin’s plan to uncover the mysteries of the titans succeeds, at the cost of his life and many others. The discoveries are unsurprising: humans created the titan threat--titans, in fact, are transformed humans--as a means of forcing rival populations, who had made war on each other and threatened the environmental well-being of the world, to cooperate. In fact, certain humans, such as several traitorous Survey Corps squad mates, possess the ability to transform into titans, and Eren Yeager, whose entire emotional apparatus is focused on hating them, eventually develops the ability to transform into a titan as well as to control the unintelligent titans telepathically. The storyline, which is as yet unresolved, raises many interesting questions about human nature. The manmade titan threat, intended to resolve petty internecine squabbling, instead failed miserably, since the group of intelligent titans living outside the walls actually became rivals of those wall-dwelling aristocratic families whose ancestors had created the titan threat in the first place. Far from remaining unified in the face of a common enemy, these other titans have forged their own thriving community, which is now bent on destroying human civilization inside the walls. The foregoing contains loads of spoilers--nothing but spoilers, really--but that’s beside the point. 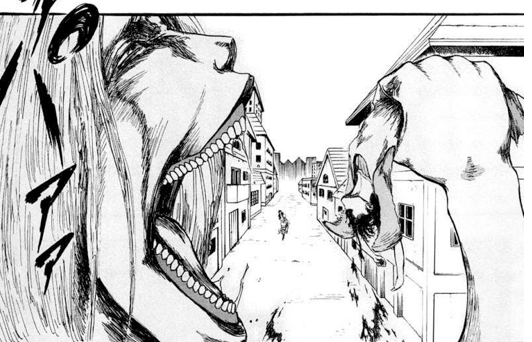 Attack on Titan’s mysteries are of much less importance than its biting social critique and amazing full-page renderings of helpless humans being chewed like bubble gum. Prior manga and anime series have featured flawed protagonists presented with seemingly insoluble moral dilemmas, but Isayama has taken this a step further: although not every character in the story can turn into a titan, they’re all repeatedly forced by circumstances to act in monstrous ways, sacrificing friends and family to survive another day. “Do whatever you think is right,” Captain Levi frequently advises Eren Yeager, which is as close as anyone in the world of Attack on Titan ever gets to articulating a categorical imperative.